Adding a touch of Gatsby glamour to your evening looks this season, this embellished pencil skirt by Lipsy will become your go-to piece for effortless chic. Featuring caviar beads to the front, this skirt sparkles and shimmers as it catches the light as well as adding elegant touches to your style. Soft jersey fabric with a mesh overlay gives this piece a stunning look, while the gentle stretch gives it an easy pull on style. 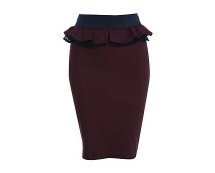 Wear this pencil skirt with a long sleeve crop top , killer patent heels and dark jewellery for a decadent dose of styling. Easy pull on style; fully lined. 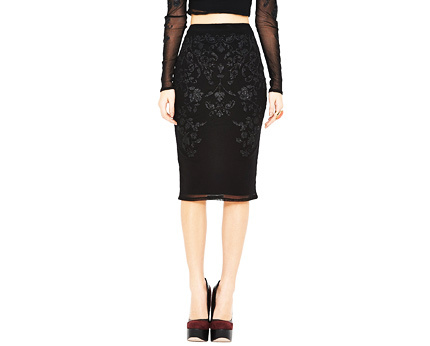 This knee-length pencil skirt featuring lace crochet floral design and zip detail at the back makes it a perfect deal for women who seek to impress! !